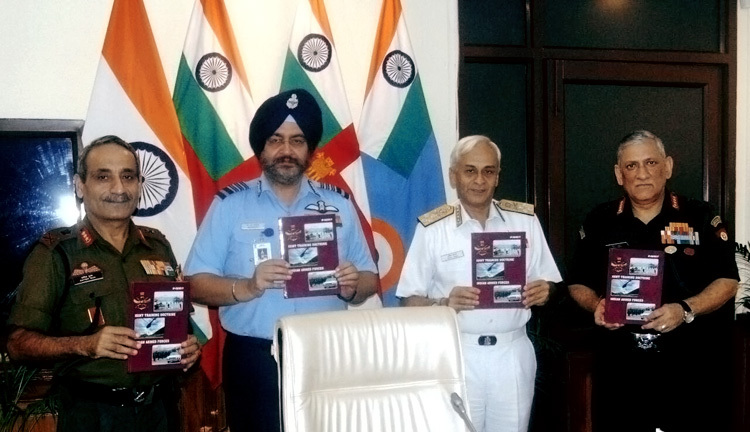 Chairman Chiefs of Staff Committee & Chief of the Naval Staff, Admiral Sunil Lanba releasing the ‘Joint Training Doctrine Indian Armed Forces - 2017’, in New Delhi on November 14, 2017. The Chief of Army Staff, General Bipin Rawat, the Chief of the Air Staff, Air Chief Marshal B.S. Dhanoa and the Chief of Integrated Defence Staff to the Chairman Chiefs of Staff Committee (CISC), Lt. Gen. Satish Dua are also seen. As a follow up to the ‘Joint Doctrine, Indian Armed Forces - 2017’ in April this year, the Headquarters Integrated Defence Staff (IDS) has now issued the ‘Joint Training Doctrine, Indian Armed Forces - 2017’, after it was recently approved by the Chiefs of Staff Committee on November 14, 2017. The 51-page doctrine aims to boost synergy and integration amongst the Armed Forces. It is quite obvious that no single service can fight the war by itself - a fact established decades back; the folly of not using the Air Force in the 1962 Sino-Indian War being one example. So, the need to train together is obvious. The joint training doctrine brings outlines the macro-level the approach to joint training, fundamentals, objectives, joint structures, planning and covers other associated connected aspects. A keystone first time document of this type, it also underlines the need to systematically prepare for war throughout the spectrum of conflict (nuclear, conventional and sub-conventional) with domains of space, cyberspace and electromagnetic active, besides special operations in support of military operations, in pursuance of building an integrated war-fighting machinery, maintains credible nuclear deterrence and guard against unconventional threats. All this is very good on paper. The problem is the lack of joint structures and unified command that can implement both these doctrines; Joint Doctrine, Indian Armed Forces - 2017 and Joint Training Doctrine, Indian Armed Forces - 2017. HQ IDS only has operational lien on Out of Area Contingencies (OOAC) and therefore can oversee limited joint training in this context on an annual basis. However, this too is ad hoc in a manner that there is no dedicated Joint Task Force (JTF) for OOAC. Hence, every time there may be fresh set of individuals training for the particular tasks. At the national level, there is no thought or strategy about joint training say of the Army, Air Force and the Special Frontier Force (SFF), which would be vital for contingencies in Tibet. No progress on the National Defence University has been reported that would be essential to train the higher leadership, same as the need to set up a Joint War College for the Military. The talk of rehashing the lopsided higher defence organizations and synergizing the Armed Forces come up periodically and after some time is brushed under the carpet, in a manner similar to defence and other scams are brought to the fore for political brownies only. So despite the politico-bureaucratic war-gaming, we remain where we are. Remember then Defence Minister Manohar Parrikar stated during the India Today Conclave in March 2015 that the CDS was a must and hoped to propose a mechanism for the creation of the post within the next three months? In July 2015, media reported the proposal to create the new post of a Permanent Chairman of COSC (PC COSC) was in "an advanced stage of planning". Not very surprising a faux passé then emerged whether a CDS or a PC COSC will be appointed. A national daily promptly mentioned “consensus” about having a PC COSC instead of a CDS had emerged - consensus amongst whom? But now, talk of both the CDS and PC COSC have subsided, which may probably surface again in late 2018 keeping in mind the general elections next year. Both the Kargil Review Committee and follow up Group of Ministers headed by then Deputy Prime Minister and Home Minister LK Advani had strongly recommended appointing a chief of defence staff (CDS) but 18 years after Kargil Conflict where are we? The excuse of differences amongst army, navy, air force continue to be played even though the service chiefs unanimously affirmed to then Defence Minister Pranab Mukherjee during a tri-Services meeting on September 8, 2005 that not only a CDS must be appointed immediately, he must be given “full operational powers. In January this year, media again started talking about Tri-Service Commands and other measures like appointing a single-point military adviser, without elaborating about the latter whether it will be a CDS or PP COSC. These are actually games being played with India’s national security. It is common knowledge that India does not have a cohesive National Security Strategy (NSS). In fact, this was admitted in Parliament in May 10, 1995 by the then Prime Minister Narasimha Rao when he stated, “We do not have a document called India’s Defence Policy. But we have several guidelines which are followed, strictly followed and observed... This policy is not merely rigid in the sense that it has been written down, but these are the guidelines, these are the objectives, these are the matters which are always kept in view while conducting our defence policy.”. He did not amplify what these several guidelines were that were strictly being followed and observed, but the fact is that the defence of India remained in such dire neglect including pathetic equipping of the military and its operational components certainly proves that these so called guidelines and their follow up was grossly inadequate to put it mildly. Yet no government has ever bothered to bridge this vital void that adversely impacts India’s national security at the strategic level. This talk of creating Tri-Service Commands and a single-point military adviser too indicates random measures that may be by design or lack of understanding. Now the grapevine is that the CDS stands dumped altogether, though no reason has been given for doing so. Defence Minister Nirmala Sitharaman is yet to make any statement on such issues. It hardly needs emphasis that without unified commands and unified defence structures, joint doctrines worked out by the Armed Forces remain only as good intellectual exercises.